I consider myself a fan of Neil Young’s music, but not a fanatic. When this autobiography came out in 2012, I wasn’t eagerly anticipating it, and it was a Kindle Daily Deal that eventually convinced me to buy it. I am very glad I did, for Waging Heavy Peace really exceeded my expectations. Those expecting a conventional tell-all rock exposé will be disappointed. There’s not a whole lot of rock star gossip included here. Brief mentions are made of Bob and Bruce (Dylan and Springsteen) as old friends who have helped him out of a jam. There’s also some limited discussion of collaborators like Pearl Jam, Devo, and Linda Ronstadt. Mostly, however, he concentrates on his former bandmates Crosby, Stills, Nash, and the guys from Buffalo Springfield and Crazy Horse. One aspect of being a musician that Young covers very well is the artistic and technical processes of recording albums and putting on live shows. Fans who are familiar with his musical catalog will enjoy the details he reveals about how he wrote certain songs, assembled various bands, or recorded particular albums. Yet Young provides a broader vision of the rock star as father figure to a sort of entrepreneurial mini-corporation. He discusses in detail the business aspects of music, and devotes a lot of stories to the large entourage of friends on his payroll: managers, producers, supporting musicians, doctors, lawyers, graphic designers, caregivers for his disabled son, and caretakers of his houses, cars, trains, and guitars. The end result is an unglamorized and unpretentious view of the rock star life. Young is an avid collector of cars and model trains, both of which he gushes over with a great deal of affection. Often a chapter begins with a story about a car, than takes an unexpected turn into a moving tale of love, music, drug use, or health issues. He devotes a lot of ink to two of his current obsessions. Pono (formerly called PureTone) is a high-resolution format for digital music that Young is attempting to market as an alternative to the low-quality mp3. LincVolt is the project name for a giant 1959 Lincoln Continental that he has transformed into an electric car. At times these techie diversions distract too much from the music history, but they also reveal a lot about the author. Young’s nostalgic reverence for the past and his enthusiasm for cutting-edge technology combine in a singular way to form and inform his music and his life. Waging Heavy Peace has its faults, but it ultimately succeeds because you really do get to know Neil Young. Of course, the more you like his music, the more you’ll enjoy the book. I liked this book so much that I actually rationed chapters to make it last longer. I hope Neil’s still got a few more books left in him, because I am eagerly awaiting the next one. The Corsican Brothers, a short novel by Alexandre Dumas, was originally published in 1844. The narrator of the story is Dumas himself, or at least a famous Parisian author named Alexandre. Visiting the island of Corsica as a tourist in the Spring of 1841, the writer seeks to experience the rustic local color of France’s most remote province. In the small mountain village of Sullacaro, he decides to take advantage of some of the famous Corsican hospitality and requests lodging in the home of a local family. He is welcomed with open arms by the owner of the house, the widow Madame de Franchi, and her son Lucien, a dashing young example of a Corsican country gentleman. The author soon learns that Lucien has a twin brother, Louis, who is a lawyer in Paris. Though the de Franchi brothers are almost identical in appearance, they could not be more different in their lifestyles, habits, and dispositions. The two were in fact born conjoined twins, separated surgically in infancy, and they share an uncommon bond with one another despite the physical distance which separates them. The first half of the book is spent with Lucien in Corsica, where the author witnesses the unique Corsican custom of the vendetta—a blood feud between families which can be declared over matters as trifling as a dispute over a chicken, yet may result in dozens of murders being committed between the families in question over the course of many generations. The second half of the book is spent with Louis in Paris. Here the author becomes involved in the more civilized pursuits of operas, salons, mistresses, and duels. The latter pastime is explored in great depth, as the reader becomes involved in the complete process of a duel, from the choosing of the seconds to the selection of weapons to the delivery of the fatal bullet. Those expecting the swashbuckling fare of The Three Musketeers may be disappointed by The Corsican Brothers. Though several movie adaptations have been made from this story, often featuring the clashing of swords, this is hardly an adventure novel. Atypical of Dumas’s work, its leisurely pace and first-person conversational tone remind one of the writings of Sir Arthur Conan Doyle. As is often the case in Conan Doyle’s novels, secrets are revealed slowly over time, action scenes are few and far between, and there is a hint of the supernatural in the proceedings. In this case the reader can see the ending coming a mile away, yet it’s not so much predictable as it is simply inevitable. Though it may not offer up all the thrills that Dumas is famous for, The Corsican Brothers nevertheless does not fail to satisfy. It may be short on physical action, but it contains enough romance and intrigue to insure there’s no lack of psychological suspense. The well-crafted story, inviting atmosphere, and camaraderie among the characters provides for a pleasant and amusing read. It is a brief work, composed of twenty short chapters, five or six of which can be easily read in one sitting. Due to some of its dark undertones, I wouldn’t call it light reading, but Dumas didn’t attempt to make it particularly deep or meaningful either. It may not be a monumental classic along the lines of The Count of Monte Cristo, but The Corsican Brothers is definitely an entertaining read and a few fun hours well spent. The Mystery of Cloomber is one of Sir Arthur Conan Doyle’s first novels. Though it was not published until 1889, after he had achieved some fame with his first Sherlock Holmes book, this novel was actually written a few years prior to the debut of the famous detective. In this early work one can see the promise of things to come in Conan Doyle’s illustrious career, but it does not stand out among his oeuvre as an exceptional piece of work. As the title indicates, this is a mystery novel, but unlike the Holmes stories this tale has a rather Gothic feel, complete with supernatural occurrences. The book is narrated by John Fothergill West, a young man who moves with his family from the city of Edinburgh to the country estate of Branksome, a remote outpost on the desolate moors of Scotland. Soon after their arrival, the West family gets some new neighbors when General Heatherstone and his family move into the long-vacant Cloomber Hall, about a mile from Branksome. The General’s behavior, however, is anything but neighborly. He shuts himself and his family up in the tower of Cloomber and refuses to socialize. West eventually learns that the family has some deep, dark secret, and General Heatherstone lives in fear of an inevitable and impending doom. What terrible secret could this mysterious man be hiding? For most of the book, West’s investigative strategy for solving the mystery consists of pleading with members of the Heatherstone family to reveal their secret, which they adamantly refuse. The mystery seems to be related to the General’s military service in the Afghan War, but Conan Doyle does a poor job of doling out clues. Rather than revealing just enough information to keep the reader in suspense, Conan Doyle gives away only enough to engender boredom. Nothing much happens in the book until chapter 11, at which point it does become more interesting as it ventures into the realm of Eastern mysticism. Though the idea behind the story is quite good, the execution is disappointing. Conan Doyle’s talent for crafting vivid narration and spirited dialogue are definitely on display here, but the book sorely lacks in its plotting. It becomes clear early on that the author is going to make the reader wait until the second last chapter to reveal General Heatherstone’s wartime back story and then close with an epilogue. All the prior chapters are just filler you have to wade through to get to the meat of the matter. One sees a similar structure in the early Holmes novels as well, but to a less obvious extent. Conan Doyle quickly improved and made great leaps and bounds in the advancement of the mystery genre. Unfortunately, The Mystery of Cloomber is an embryonic stage in that development, and feels clumsy in comparison to the master’s later, greater works. Fans of the Holmes mysteries or Conan Doyle’s writing in general will not hate this book, but it does inspire ambivalence. It’s hard to imagine a better book on Jack Kirby than this 2008 retrospective by Mark Evanier. Part biography, part coffee-table portfolio of the master’s art, Kirby: King of Comics succeeds immensely on both levels. Kirby is famous primarily for his revolutionary work at Marvel Comics, in particular his creation or co-creation of heroes like the Fantastic Four, the Incredible Hulk, Captain America, Thor, Iron Man, and the X-Men, among many others. While this book gives these golden years their due, Evanier wisely and judiciously takes an in-depth look at Kirby’s entire career, treating each period fairly and giving all his myriad creations their due, from his Golden Age work in westerns, romance, and horror comics; to his partnership with Joe Simon in creating some of the earliest superheroes; to his legendary work at Marvel; his bizarrely fascinating sci-fi tales for DC; his later work in animation; and odds and ends for minor publishers along the way. The result is an intimate glimpse into the mind and the profession of a man who was creativity personified. On the one hand he was a workhorse capable of cranking out thousands of pages at an alarming rate. On the other hand he was a perfectionist who upheld the highest standards for jobs others might have considered hack work, and who pushed the envelope of his medium to take it to places others couldn’t have imagined it would go. There is an undercurrent of tragedy to Kirby’s story. While he was a brilliant artist, he was a lousy businessman. Despite being at the top of his craft, he spent most of his life struggling to make ends meet. He was exploited and abused by many of the publishers who employed him, and never given due recognition for his creations, particularly at Marvel. Evanier is clearly on Kirby’s side when it comes to discussions of his various legal disputes. He doesn’t shy away, however, from pointing out when Kirby made a stupid business decision or even when he made a bad comic. Evanier tries to be objective and impartial when detailing the raw deals that Kirby was subjected to. He never really goes after Marvel Comics’ celebrity ringleader Stan Lee, for example, yet he never really tells Stan’s side of the story either. I suspect this is due not to bias on Evanier’s part, but rather to the fact that Stan the Man probably wouldn’t talk to him about it. Evanier once worked as an assistant to Kirby and shared a personal friendship with the man, which isn’t really made clear until the book’s Afterword. At times Evanier’s tone can be a bit casual, as if he can’t make up his mind whether he’s writing a definitive biography or just a personal memoir. Overall, however, the biography takes precedence over the personal reflections. The collection of art here is absolutely fabulous, and the variety is astounding. As mentioned before, the book covers all aspects and subject matter of Kirby’s career. The art selected also represents different stages in the production process. Included are pencil drawings, inked pages, scans of original art showing paste-ups and deletions, and full-color printed comic book pages. The selections take the various forms of lettered panels, wordless presentation drawings, animation storyboards, or entire short stories. In all cases, every piece of art in the book is beautifully reproduced in brilliant color and clarity. This book is a must-have for any Kirby fan or anyone who appreciates the history of comic art. It’s also a perfect memorial to a genius who never got his due. With this book, there can be no doubt that Kirby was indeed the King of Comics. The Kempton-Wace Letters, originally published in 1903, is an epistolary novel, meaning it is written entirely in the form of letters between fictional persons. The book is a collaborative work by Jack London and Anna Strunsky, who each write in the guise of one of the two titular characters. Strunsky takes the part of Dane Kempton, an elder poet and man of letters residing in London. The words of Herbert Wace, a young sociologist in Berkeley, California, are penned by Jack London. When Wace informs his mentor that he is going to be married, Kempton expresses dismay that the young man has not waxed more rhapsodically over the merits of his future wife. Kempton feels that marriage should be founded on an all-consuming romantic fervor, while Wace holds the more practical view that marriage should only be undertaken with a well-chosen, compatible mate who will make a good life companion and mother for his children. The book consists of the dialogue between these two gentlemen, Kempton championing romantic love while Wace advocates the importance of reason in forming a successful relationship. Their debate could easily be summed up in a few paragraphs, but London and Strunsky stretch the conversation out to book length for the sole purpose of indulging themselves in flowery language and literary allusion. This exercise in pointless verbosity results in a book only a hundred-year-old poet could love. Habitual readers of London will recognize some of the familiar Darwinian themes that often show up in his works. Some of his more scientific passages, in which Wace explains love as the end result of millions of years of behavioral evolution, are really quite well-argued. He takes his rampant rationalism too far, however, when he suggests concepts that come uncomfortably close to eugenics, like “when we [mankind] come scientifically to breed the human.” Though at times London’s letters contain a kernel of scientific insight, the contributions of Strunsky are almost unintelligible. Kempton’s arguments for romantic love could charitably be called philosophical, but for the most part are merely sentimental. Kempton responds to Wace’s evolutionary theories with poetic paeans to the love-muse. The two aren’t even speaking the same language, resulting in bewilderment and boredom for the reader. The two correspondents spend so much time referencing philosophers and poets that only a few fuzzy details are given regarding their personal lives, which makes it even more difficult to care about them or what they have to say. Kempton is described as a father figure to Wace, a former friend of his parents, and possibly his former professor. Wace has a sister, Barbara, who apparently lives in London with Kempton. She is married to a man named Earl, who is so briefly mentioned it’s as if the reader is expected to have prior knowledge of his existence. It’s frustrating for the reader to try to ascertain the ambiguous relationships between the characters based on the sparse, tiny crumbs of information occasionally tossed out by the authors. In real life, London was in love with Strunsky and proposed marriage to her, though she turned him down. Whether or not a marital collaboration between the two would have been successful is debatable, but the book they coauthored can definitely be declared a failure. Even the most enthusiastic followers of London and his literature will find no pleasure in this tedious book. The Comte de Fontaine is a staunch royalist. Even during the Revolution, he remains fiercely loyal to the monarchy, though it costs him great financial loss. When Louis XVIII is restored to the throne of France, the Comte hopes to receive some compensation for the money spent and property taken during his efforts fighting for the royal family. When he makes the acquaintance of the King, he is disappointed at not receiving the restitution he hoped for. Instead, what he gets in return is a personal friendship with the King, who helps advise the Comte on how to update his antiquated notions and keep up with the times. France is not the same as it was before the rise of republicanism; even Louis XVIII can admit this. In former days the Comte would have only married his children to members of the titled nobility, but under the King’s guidance he prudently consents to marry his sons and daughters into the nouveau riche families of bankers and civil servants. By doing so, the Comte improves his financial outlook considerably. His youngest daughter, Emilie, however, sees herself as above such a compromise. Raised a spoiled child, she has grown into a beautiful but stuck-up young woman. Emilie has incredibly high standards for the man she will marry, and at the top of her unreasonable list of criteria is that he absolutely must be a peer of France. After several aborted attempts to find her a match, the Comte wonders if he has any hope of sealing a matrimonial deal for his troublesome daughter. The Ball at Sceaux, originally published in 1830, is one of the earliest works in Balzac’s Comedie Humaine. Balzac wrote for a mass audience, so his works are usually quite accessible to the general reader. However, historical and political concepts that were common knowledge to the audience of his time are now lost on many of today’s readers, particularly those outside of France. He often writes about the clashes between persons of differing political persuasions and social classes. Often in order to understand what he is talking about, the reader must have a basic understanding of French history, particularly the events surrounding the Revolution. This is more true of The Ball at Sceaux than for most of his works. If you don’t have a solid orientation into the time period you are going to be lost. Another problem plaguing this novella is that one of the main characters, Emilie, is not very likeable at all. The reader is not inclined to care whether she finds true love or not. Nevertheless, the concern one feels in regards to the successful completion of the young woman’s marriage stems not from any affinity for her but rather out of sympathy for her father, the Comte de Fontaine. The Ball at Sceaux is kind of a hard work to get into. It starts out rather slowly, establishing a lot of elaborate context. Halfway through the book the reader wonders if there will ever be a ball, or if the story will ever get to Sceaux, a suburb of Paris where the wealthy have their country houses. Ultimately, however, the reader need have no fear, because the second half of the story is much more engaging than the first. Towards the end it offers some unexpected developments, and Balzac wraps it all up with a satisfying conclusion. Though it’s not his best work by any means, The Ball at Sceaux is a good, solid story that fans of Balzac will enjoy. I would not recommend it as a starting point for those who have never read Balzac, and if you’re not familiar with your French history, you’d better look up the Revolution on Wikipedia and bone up on the basics. The Machine is a three-act play by Upton Sinclair, which was originally published in 1912 in the collection Plays of Protest. Although it contains some of the same characters who appeared in his novels The Metropolis and The Moneychangers, it is intended to be a stand-alone piece and requires no prior knowledge of those previous books. The play exposes the system of patronage and graft established by the Tammany Hall organization, a corrupt political machine which controlled New York politics through the early 20th century. Three socialist activists intend to educate a wealthy young woman who has expressed a curiosity toward their political views. This socialite and philanthropist, Laura Hegan, is the daughter of Jim Hegan, a railroad baron, who is in cahoots with the Tammany gang. When Laura’s newfound friends conduct an investigation into some of Hegan’s shady dealings, the daughter is rudely awakened to the corrupt activities of the father. The plot revolves around the usual struggle of socialism against big business which dominates Sinclair’s entire body of work. The one unexpected aspect to this story is a brief mention of human trafficking. Hegan supports Tammany Hall in order to further his business interests, while a white slavery ring supports Tammany Hall in order to protect their criminal activities, so it is implied that Hegan is inadvertently supporting human trafficking and prostitution. This thread, however, is little developed. Readers familiar with Sinclair’s work will find few surprises here. That’s not to say the piece is unworthy of reading. Though it covers familiar territory, it covers it well, and neither bores nor disappoints. As is common in Sinclair’s work, the separation between the forces of good (socialism) and evil (capitalism) is as stark as black and white. In the third act, however, he introduces some refreshing shades of gray into the debate. I don’t believe The Machine was ever produced for the stage, and I’m not sure I would want to sit in a theatre for an hour and a half and watch it, but when read as a short story it makes for a brisk and satisfying read. It’s almost all dialogue, with little stage direction, so it’s very easy to forget that you’re reading a play. I have not yet found a work of Sinclair’s fiction that compares to his masterpiece The Jungle, and this play doesn’t come close to attaining the literary heights of that great novel. Yet for those who enjoy Sinclair’s writing, have an interest in the political history of this time period, and sympathize with the author’s message, reading The Machine is worth the brief time spent. Demian, first published in 1919, is a coming-of-age novel by Nobel Prize-winning German author Hermann Hesse. It is narrated by Emil Sinclair, who recalls events from his youth and adolescence. At the age of ten, Sinclair tries to impress some older, rougher boys by claiming that he once stole some apples from a local miller. The bully of the group, Franz Kromer, threatens to report Sinclair’s theft for a reward, unless Sinclair finds some other way of financially compensating him. Thus Sinclair finds himself blackmailed for a crime that never happened, and he becomes a slave to Kromer. This stressful ordeal is psychologically devastating to Sinclair. The deceptions and petty thefts he must engage in to satisfy Kromer cause him to fall prey to self-loathing and to distance himself from his family. He begins to see his universe as being divided into two separate worlds: the world of illusion that has occupied his youth, in which all is good, loving, and harmonious; and the world of reality, in which all is dark, selfish, and evil. The deeper Sinclair becomes involved with Kromer, the more he peels back the veil that hides this dark underworld. This first part of the book, consisting of roughly the first three chapters, is really quite excellent. Hesse proves himself an incredibly perceptive interpreter of the youthful mind. He vividly captures the vital moment at which a young boy makes the harsh realization that he’s more than just the son of his parents and must take responsibility for his own life. Sinclair then meets a classmate named Max Demian—an older boy, very intelligent, a loner and a nonconformist. Demian opens Sinclair’s eyes to new ways of thinking and mentors him through the painful transition from childhood to adulthood. Here Hesse begins to introduce themes and imagery from the world of Jungian psychoanalysis, and the book becomes preoccupied with dreams and mystical visions. As Sinclair begins to forge his own path in life, he encounters, through Demian, a secret society of like-minded nonconformists who engage in thoughts and ceremonies outside the restrictive traditions and norms of conventional society. Unfortunately, the more Hesse departs from the realistic tone of the opening chapters the less compelling the book becomes. The trippy imagery influenced by psychoanalysis is material that he wields to far better effect in his later novel Steppenwolf; here it feels a little half-baked. Demian unfortunately acts not only as a mentor and guide to Sinclair, but also as a savior, in effect rescuing him from much of the trials and tribulations of growing up, thus rendering the coming-of-age story a bit irrelevant. There’s something juvenile about the idea that for those who feel like they don’t belong there is a secret brotherhood of misfits out there just waiting to accept them. Sinclair feels that he and his comrades wear a mark of distinction upon their heads that signifies they are somehow better, smarter, more enlightened than “the herd” of society. This sort of elitism comes across as rather narcissistic and immature. One could easily imagine that the conservatives, warmongers, and xenophobes who don’t share Sinclair’s (or Hesse’s) views might also see themselves, no matter how misguided or repulsive their ideals, as “above the herd”. In the final chapter there is another shift in tone as the characters are confronted by World War I. Here Hesse really has some profound things to say about how war brings out the worst in mankind, yet also creates an opportunity for humanity to rise to new heights and evolve as a society. Unfortunately the middle portion of the book, the Jungian section, is by far the longest and the least satisfying. The novel suffers overall from its inconsistency, and also comes across as a bit pretentious. Demian was no doubt a ground breaking novel for its time, but it pales in comparison to Hesse’s later masterpieces Siddhartha, Steppenwolf, and The Glass Bead Game. Epictetus, the Stoic philosopher of ancient Rome, did not leave behind any writings of his own, but fortunately his lectures were transcribed by a student, Arrian, and compiled around AD 108 into the collection known as the Discourses. The Discourses consist of 95 chapters of varying length divided into four books. The chapters don’t necessarily follow each other in a sequential train of thought. Nevertheless, Arrian did a pretty good job of editing and ordering the pieces so that they do proceed in a somewhat logical progression. Of the works by ancient Stoic philosophers that have been passed down to us, the Discourses is rightly seen by many to be the most important and complete expression of the thought of this ancient philosophical school. The Stoic philosophy, as taught by Epictetus, can be expressed in a nutshell, as follows. Some things in life are within our control, while others are not. Those which are in our control are our own will, our opinions and desires, and the actions which we assent to. Everything else is beyond our control and should be accepted rather than hated or feared. The key to happiness and tranquility is to live one’s life in accordance with the natural order of things. This is done by rejecting irrational desires, resigning oneself to providence, and forming one’s opinions to accept what the universe dispenses. Everything beyond the control of one’s will is neither good nor bad, but indifferent. By utilizing one’s faculty of reason, to want only those things which are in our control, we can live a life free of anger, fear, grief, frustration, and shame. Of course, the Discourses go into much more detail as to how this is accomplished, but these are the fundamental ideas. Epictetus believed that philosophy was useless unless it changed people’s lives for the better. He had little tolerance for philosophy as a pointless intellectual exercise. His teachings are filled with practical concepts that his students, ancient or modern, can use to live happier and more meaningful lives. It is almost useless to highlight passages from the Discourses, because there’s hardly a sentence contained therein that’s not worthy of being singled out as a pearl of wisdom. The book’s only fault is that it is quite repetitive. The same messages are reiterated over and over, so that they become second nature to the student. For that reason, it’s most effective to read the Discourses in small chunks, and allow yourself time in between servings to digest its lessons. Such repetition, of course, is a useful tool of all inspirational texts, and the Discourses can be seen as a sort of secular Bible, a book to turn to for advice when in need of solace or personal clarification. Epictetus uses the word “God” many times throughout the Discourses, but it is used synonymously with comparable terms like “nature,” “the gods,” “Zeus,” “fate,” or “providence,” making it clear that his idea of God is different from the Judeo-Christian sense of the word. The ancient Greek and Roman philosophers’ conception of a monotheistic deity was a sort of precursor to the Christian version, and was much more Pantheistic in nature, resembling a kind of universal force that governs and guides the actions of the universe and the lives of men. This force could either be interpreted as divine direction or materialistic determinism, thus the basic teachings of Stoicism can be appreciated and utilized by readers of all beliefs, theist or atheist alike. The Discourses is really too complex to be of interest to the casual reader simply looking for self-help advice, but for anyone who takes philosophy seriously, this book will change your life. After sampling a few of the inexpensive Kindle versions of Epictetus’s writings, I purchased a combined edition called Discourses and Enchiridion, offered by Amazon. I can’t be more specific than that, because the publisher is not named on Amazon nor in the file itself. I chose it because of its easy-to-read typography and interactive table of contents, but the file is riddled with typographic errors. It was edited by spell-check, so the typos take the form of word replacements like “be” for “he” or “the” for “they,” making it even more difficult to figure out. It claims itself to be “annotated,” but there are no notes in the Discourses, only in the Enchiridion. The translation of the Enchiridion by Elizabeth Carter is fine, but the translation of the Discourses by George Long is a clumsy read, with oddly constructed sentences and confusing terminology. I have read some passages from the translation by P.E. Matheson and found them to be a much smoother read and easier to comprehend. The generic Long edition is only worthy of two or three stars. I would recommend buying the Matheson version, even if it’s a couple bucks more. A Son of the Sun is a collection of short stories by Jack London, all of which originally ran in the Saturday Evening Post in 1911. These eight stories share a common protagonist in David Grief, a South Seas entrepreneur, trader, shipping magnate, plantation owner, and self-made man of means. “Quick eye that he had for the promise of adventure, prepared always for the unexpected to leap out at him from behind the nearest cocoanut tree,” Grief, a true man’s man, spends his leisure time seeking out action, and the islands of the South Pacific offer up plenty. In “The Jokers of New Gibbon,” Grief and his crew venture to the titular island to check on one of his remote plantations. There, a once fierce native dictator, now fallen from power and addicted to alcohol, reluctantly serves his white masters. But when a practical joke is played at his expense, he retaliates violently. “A Little Account with Swithin Hall” is a mystery tale in which Grief stumbles upon an uncharted island belonging to a wealthy trader of legend. When he enters Swithin Hall’s luxurious mansion and meets the mystery man face to face, Grief senses something fishy is going on, and decides to investigate. “The Pearls of Parlay” takes place on the atoll of Hikihoho, where a crazy old miser is auctioning off his pearl collection. The sale draws several interested parties from all parts of the Pacific, Grief included, but the proceedings are interrupted by an approaching hurricane. Even when seeking out some rest and relaxation, Grief stumbles into excitement, as in “A Goboto Night,” in which he manages to find the time, over a high stakes game of cards, to teach a boorish young jackass a lesson about being a man. While the plot summaries sound engaging enough, the stories in A Son of the Sun are far from London’s best work. Perhaps the mass appeal of the periodical that published them contributes to their tameness, or maybe it’s the recurrence of the lead character that’s the problem. One of the best qualities of London’s stories has always been his ability to shock and surprise, but there’s little chance of a surprise ending when it’s preordained that Grief will survive for the next episode. As far as short stories go, these are rather lengthy, yet they don’t possess plots worthy of such extensive treatment. Each one feels like a long buildup that yields little payoff. London takes great effort to fill out the word count with handfuls of vivid local color. He’s highly skilled at capturing the torpid atmosphere of the tropics, the macho camaraderie of the white traders and sailors, and the colorful nuances of island slang. Nevertheless, in the service of such weak story lines it all just feels like filler. Included amongst all the local color is a bit of racism, but for the most part it is appropriately accurate to the time and place. The use of the “n word” is just as justified here as it is in Huckleberry Finn. One of the book’s opening paragraphs, however, is absolutely inexcusable in its relentless comparison of black islanders to monkeys. I don’t mean to overemphasize these brief passages, because overall I wasn’t so much offended by A Son of the Sun as I was merely bored by it. If you’re looking for tales of tropical adventure written by a true master of the short story, I would recommend you forego this book and check out London’s Hawaii tales in the fine collections The House of Pride and On the Makaloa Mat. 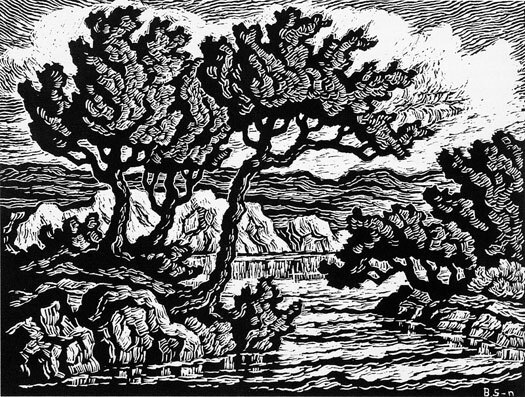 Birger Sandzén (1871-1954) is widely regarded as the preeminent artist in the history of the state of Kansas. Born and educated in Sweden, he emigrated to America in 1894 to accept a teaching position at Bethany College in Lindsborg. He taught there for over 50 years, and remained in Lindsborg until his death. He had a profound impact on the development of the arts in Kansas, yet his influence spread far beyond the borders of the state. He produced a prodigious output of paintings and prints which were exhibited both nationally and internationally. Despite its subtitle, this volume is not a biography in the traditional sense. It is a retrospective tribute in which biography plays a small part. The events and accomplishments of Sandzén’s life are not related chronologically, but rather organized thematically into a series of essays. The first three chapters are biographical in nature, but successive chapters focus on individual aspects of his career such as teaching method, travel, family and friends, painting technique, printmaking, critical response to his work, and the establishment of the Birger Sandzén Memorial Gallery at Bethany College. In the treatment of his subject, author Emory Lindquist is relentlessly laudatory. He has not come to bury Sandzén, but to praise him. From reading this book one would suspect that Sandzén never committed a sin, no one ever had anything bad to say about him, and the only hardship he ever faced was death itself. Two mind-numbing chapters of excerpts from exhibition reviews cite heaps worth of adulation, garnished with less than a handful of sentences even remotely critical of the artist’s work. Nevertheless, I enjoyed this book in spite of its lack of objectivity. What Lindquist does well is capture Sandzén's infectious excitement and enthusiasm for art and education. Despite isolating himself in a remote outpost on the prairies, Sandzén managed to execute works of art that rivaled those produced in the great art centers of the world and earned the respect of critics worldwide. Though he devoted himself to interpreting the landscapes of Kansas, the Rocky Mountains, and the Southwest, he never became an American regionalist painter. 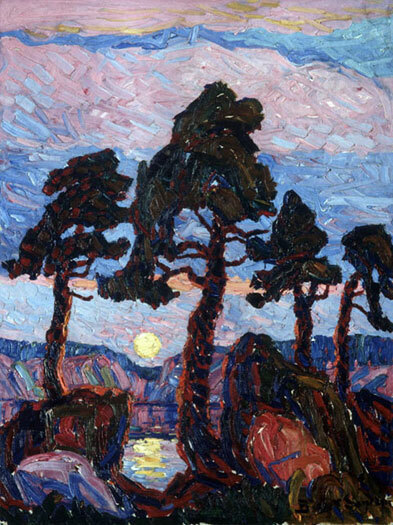 He built his own individual style upon a tripod of Nordic traditions, French impressionism, and German expressionism. Sandzén brought high artistic and intellectual standards to a small town in central Kansas, and with the help of friends and colleagues established at Lindsborg his own little Parnassus on the Plains. This volume is heavily illustrated with both historical photos of the artist and pictures of his work. To those unfamiliar with Sandzén’s art, his painting style could best be described as a combination of Van Gogh with a fatter brush and Monet on steroids. No printed page could ever do justice to Sandzén’s brilliant colors, but the 49 color plates included here succeed admirably. The 26 black and white figures reproduce his prints and drawings absolutely beautifully. In addition to presenting a lovely gallery of the artist’s work, this book is the most authoritative resource we have on Sandzén and his inspiring accomplishments as an artist and educator. For that, it is a book to be respected and treasured. 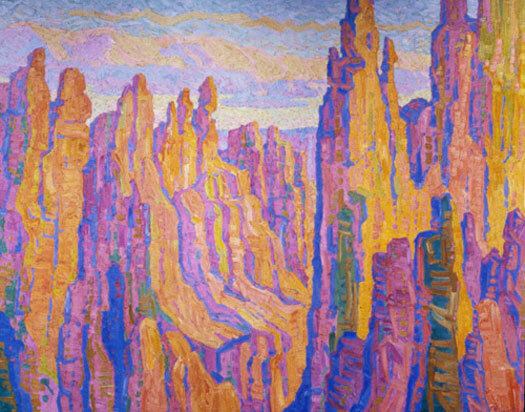 Landscape with Four Trees, 1920, oil on canvas, 35.625 x 47.75"
Hour of Splendor, Bryce Canyon, Utah, 1928, oil on canvas, 80 x 60"
Republican River, 1945, linoleum block print, 16 x 12"
Advanced Chinese Reader is the fifth and final volume in the Chinese Reader series of textbooks by John DeFrancis. It was originally published in 1966. Though the book utilizes the same effective method of instruction DeFrancis developed in the previous volumes of the series, the Advanced volume is structured a bit differently. While the Beginning and Intermediate levels are divided into two volumes each, the Advanced level is contained in one single volume. Nevertheless, it still presents 400 new Chinese characters, so the same amount of content is packed into a smaller package. This book has 25 lessons, each featuring 16 new characters and hundreds of character compounds (words or phrases). Unlike the previous volumes, there are no review lessons. Each character combination is presented in a sample sentence. Only a few of the more complicated sentences are translated into English. Each lesson also contains from nine to fifteen pages of reading passages, all in paragraph prose, sometimes in the form of personal letters. There are no dialogues in this book. The Chinese characters in this volume are one-half the height of those in the Intermediate volumes, so DeFrancis can cram a lot of material into fewer pages. Some of the individual reading passages can run as long as three pages. These longer pieces are often summaries of or paraphrased excerpts from classic works of Chinese literature and philosophy, such as the novel Dream of the Red Chamber or Sun Yat-sen's Three People's Principles. As in the previous volumes, the supplemental lessons on modern characters appear at the back of the book, along with all of the usual charts and glossaries. Because of the increase in the amount of content to be learned, and the lack of review lessons, this volume requires a lot more hard work on the part of the reader to learn and retain the information. It’s not quite as simple as the learning by osmosis that one experiences with the Beginning and Intermediate levels. You must do your own reviewing, including memorization drills, in order to keep all the characters straight, or you will drown beneath the flood of new characters and compounds that inundates you with each chapter. Still, if you’ve made it this far, you’re probably willing to put in the extra effort, and the harder you work the more you’ll learn. The copy of this book that I received from Amazon appears to be a print-on-demand book, meaning that instead of the publisher printing up thousands of copies on a printing press and then storing them in a warehouse, the book is laser printed after you purchase it. Though it’s not glaringly noticeable, the printing is not of the same level of quality that you get from an offset printing press. The result is that some of the more intricate Chinese characters are difficult to read because the spaces between strokes fill in and the details get muddy. Of course, if you ever try to read a Chinese newspaper, the characters aren’t going to be crystal clear either, so in that sense this book offers you some practice in distinguishing hard-to-read characters. Although I’m not crazy about the quality of the print-on-demand process, it serves the purpose of making it cost effective for the publisher to keep this book in print, thereby insuring that those with a desire and determination to learn the written Chinese language will always have access to this important and effective textbook. This Kindle collection is a repackaging of three previously published Elmore Leonard books, all featuring Deputy U.S. Marshal Raylan Givens, the character now made famous by the TV series Justified. The first two works, Pronto and Riding the Rap, are novels originally published in 1993 and 1995, repectively. If you’re buying this volume solely because you’re a fan of Justified, you should be warned that Raylan is not necessarily the star of these books, but rather a member of an ensemble cast. In these novels the bad guys get just as much ink as he does, if not more. The third book in the Kindle file, Fire in the Hole, is a collection of short stories, first published in 2002 under the title When the Women Come Out to Dance. Only one of the stories, entitled “Fire in the Hole,” features Raylan Givens. The other eight stories cover a wide gamut within the crime and western genres and beyond. The first book, Pronto, begins by introducing us to Harry Arno, a 65-year-old World War II veteran and longtime Miami bookie. The feds, in an attempt to nail Arno’s mobster boss, spread the rumor that Harry is stealing from his employers. Raylan is assigned to protect Harry, but when Harry flees for his life, thus becoming a fugitive, it’s Raylan’s job to apprehend him. Over the course of the book, much is revealed about Raylan’s past in Harlan County, the Glynco Academy, and elsewhere. Riding the Rap picks up where Pronto left off. While Pronto was very much a character driven novel, in Riding the Rap the characters are already established and Leonard does little to develop them further. It is the least successful of the three books here, and not much is revealed about Raylan that we didn’t already learn from the first book. Despite all the twists and turns in the plot, there are few surprises, as Raylan spends the entire book working to find out things that Leonard has already revealed to the reader. “Fire in the Hole,” the novella that’s included here as part of the third book of the same name, is better than either of the previous novels. Raylan, who has served the U.S. Marshal Service in Miami for several years, is sent back to Harlan County, Kentucky, where he was born and raised, to take part in a task force aiming to take down Raylan’s former friend Boyd Crowder, a white supremacist who robs banks and blows up churches. The story will be familiar to those who watch Justified, as the first few episodes of season one were quite faithful to Leonard’s original narrative. The Fire in the Hole collection also contains several excellent short stories that have nothing to do with Raylan. Whether you're a fan of the Justified TV show or not, Leonard’s skillfully crafted prose is a joy to read. He has a talent for elegant understatement and a brilliant knack for writing clever, snappy dialogue. These books have a lighthearted tone overall, with a wry sense of humor, yet the life-and-death confrontations in the book are still intensely suspenseful. This Kindle file is well constructed, with a convenient table of contents that links to every chapter. There are about a dozen typographical errors in the entire three-book file, mostly in Pronto. From the nature of the typos, it seems optical character recognition was used to construct the file, but the errors are not annoying enough to hinder your enjoyment of the work. If you’re going to buy one of these books, you might as well buy all three, and in terms of convenience and price, this three-book collection is hard to beat. If you liked this review, please follow the like below to Amazon.com and give me a “helpful” vote. Thank you.